Motor controls come in all shapes and sizes. Whether your application is a drive motor for a small, hand-held drill or saw, a fan motor for a vehicle application, or a kilowatt-sized motor/generator for aerospace applications, Electronic Concepts and Engineering has the knowledge to make your control a reality. ECE can provide a full range of motor control solutions for your brushless DC (BLDC) motor, stepper motor, or induction machine application. 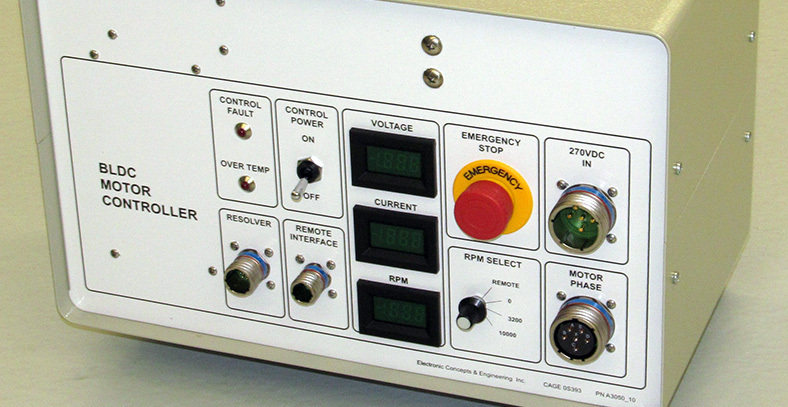 ECE can provide hardware solutions that interface three-phase inverters to control your brushless DC motor or induction machine using custom and/or Commercial-Off-The-Shelf components. ECE can design your electronic motor controls for low power (a few watts) to high power (tens of kilowatts) systems and for a variety of harsh environments (temperature, vibration, altitude, etc.). ECE’s designs can use microcontrollers, FPGAs, or motor-control-specific driver circuits. Drive circuitry can be single FETs forming an inverter, integrated half-bridge drivers, or fully integrated three-phase inverter technology. ECE’s in-house engineers design hardware solutions for BLDC and induction motor controls, schematics, and printed circuit boards to fit into custom enclosures of varying physical dimensions, as called out by your specific application. Additionally, ECE’s designers produce designs capable of driving sensor-based or sensorless applications. In addition to performing as your motor controls designer for motor drive hardware, ECE also has the capability to act as your software team for software design, designing implementing, and verifying your motor control software solutions. Whether it is using conventional six-step commutation based on Hall Effect Sensors, back EMF detection methods or Field-Oriented-Control for sensorless brushless DC control, or sinusoidal PWM utilizing Harmonic Elimination techniques for control of BLDC and induction machines, ECE can provide a full software solution that interfaces your motor to its electronic controls. ECE’s control software can be designed for single quadrant, two quadrant, or four quadrant control to allow for uni- or bidirectional rotation, depending upon your application. ECE has the full range of capabilities to be your motor controls consultants, having the experience in hardware and software solutions for brushless DC motor control, induction motor controls, and stepper motors.